We are now into October, and while this Fall's storm of new releases might not be as violent as last year's, those who enjoy riding the new release train face a daunting task. The tension between time, money, and games was thrown into sharp relief last week, when Jorge and I discussed the Fall lineup in detail. I realized that, even after discounting all of the Lego games, rhythm games, and Lego-rhythm games, there is still a sizable list of titles I want to experience. Some, like Assassin's Creed 2, are basically double the commitment, as my own personal neuroses prohibit me from playing the second game before the first one. Others are unexpected surprises like Brutal Legend or Demon's Souls. There are also games that I have been anticipating for months, like New Super Mario Bros. Wii and Modern Warfare 2. On top of this, there is my pile of shame to attend to: I've been stuck on the last boss of Henry Hatsworth for weeks. I've been a quarter of the way through Killer7 for months, and I have yet to even finish a Halo game! How can I possibly alleviate the pressure to keep up and the anxiety of knowing that there are games out there that I am missing. My only recourse is to lock myself inside, order ten cases of BAWLS, and power through the entirety of my back catalogue. On second thought, perhaps I'll just play Secret of Mana instead. 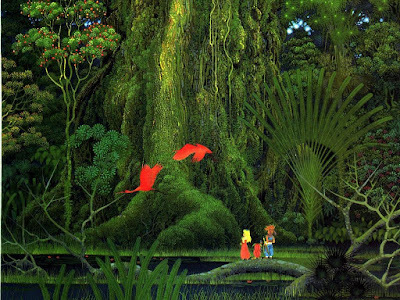 Since its release in 1993, Secret of Mana has become one of the few games that I revisit when life gets hectic. A combination of its gameplay, its presentation, and its nostalgic cache have kept me coming back for the past fifteen years. Secret of Mana's battle system stands out as unique, even after all this time. While character movement and attacks take place in real time, the implementation of an attack meter prevents combat from devolving into button mashing. Cool-down time between attacks and optional charge-up techniques must be weighed carefully against the need for immediate action. While spell selection pauses the battle, casting is done in real time, allowing the player or enemies brief opportunities to counter-attack. Unlike most other JRPGs, Secret of Mana's combat is integrated with its landscape. The random enemy encounters found in games like Breath of Fire and Final Fantasy IV whisked players into contrived arenas made to look, feel, and sound different than theoverworld areas. Secret of Mana always made me feel like I was exploring an actual world, as the land in which I encountered beasts and the land in which I explored for treasure were one and the same. The game is not without its shortcomings. The plot is best described as cornballs served with a side of cheese, sprinkled with genre conventions. The heroes are a young boy who finds his destiny in mysteriously intertwined with a magical, a rebellious princess whose moxy hides a sentimental side, and magical sprite robbed of his identity by amnesia. Plot twists can be seen from a mile away, and certain parts of the localization are a bit suspect. In true 1990s JRPG form, menu tweaking and EXP grinding were often the order of the day. The game could be played by up to three players simultaneously, but solo adventurers were left to grapple with the AI. Computer controlled characters often fell victim to the most dastardly of traps: the corner! Despite all this, I am continually drawn back by the game's ability to evoke a sense of exploration. When I first played the game, Google, YouTube, and rabid fans had yet to create the exhaustive amount of reference material that exists today. Because of this, Secret of Mana lived up to its name; the title screen itself teased the end of the game, challenging players to find their way to the Eden pictured in the opening credits. When my nerdier friends and I would gather on the weekends to exchange tips on weapon upgrades and discuss the best spell combinations, we would often veer off into conversations about the game's fiction and begin theorizing about the laws that governed this fantastic world. Even today, that haunting opening song brings me right back to the first time I played it. I cannot be the only one inclined to wax nostalgic about old games, so I will turn it over to you folks: What are your "security blanket" games? Which titles still have the power to trump the newest, shiniest new releases? Did anyone else get a few goosebumps while watching that last video, or is that just me? Bubble Bobble is probably my security blanket game, although I haven't played it in quite a while. I still have the original NES cart, though I mostly play the Virtual Console version or the GBA port. It's a comfortable game for a few reasons: simple gameplay, short stages, and the variety of minor puzzles. While it isn't exactly easy, as it does have a solid difficulty curve, it doesn't really have any penalty for failure. Bubble Bobble also evokes several levels of nostalgia, as it was both one of my first multiplayer games and one I would return to with new friends over subsequent decades. I'm sure newer games can be reassuring like a security blanket, but nothing beats the old classics for providing digital comfort. My nostalgia-inducers are also SNES games: Star Fox and EarthBound. Really, these are the two games that got me into gaming. Star Fox's presentation was really incredible; they conveyed a lot of personality with only about 50 on-screen polygons at once and a lot of "bip-bip-bip!" pseudo-speech. The game was suitably difficult, too; I still have lots of trouble with Route 3. The N64 sequel was arguably a better-designed game, but the original's no slouch, and holds a greater place in my heart. As for EarthBound, that was the title that introduced the concept of "art games" to me. Sure, it's not like it didn't have its flaws, but its heartfelt presentation and strange, nostalgic sense of humor and wonder still bring me back every couple of years to play through it again. I'd also recommend the sequel to this one, Mother 3; it's one of the few sequels that manages to live up to the expectations of its predecessor and yet also tread new ground. Secret of Mana was the only JRPG I owned as a kid, all the others I only rented (time and time again, mind you). I bought it used, without a box, in a Florida game store somewhere. Oh, many fond memories there. It's definitely a favourite, but I'll have to echo David and say that Earthbound probably evokes nostalgia more than any other title from that era. Super Mario RPG and Donkey Kong Country are probably close seconds though. For a very long time Morrowind has been a security blanket game for me, I have many high level characters in this game and thanks for the well supported and enthusiastic mod scene that game enjoyed I always have some new item, quest or town I can explore. It provides new fresh experiences and a familiar world that feels welcoming because I know so many of the special little secrets. I don't really have an old security blanket. I mostly go back to TF2 and Left 4 Dead. But I do take great comfort in knowing Final Fantasy 8 is nearby should I need it. I have lots of good memories of Secret of Mana and playing it with my brother. It was one of the first games that got me into RPGs (I hadn't heard of FF since at the time I was living in a small town in Oregon) and I really enjoyed it. I have Children of Mana for the DS but it doesn't really have the same charm. I still need to play Sword of Mana and see if that's any good, I really hope it is. Thanks for all the comments folks. Walking down memory lane is always more fun with company. I hear you on the warm-fuzzy feeling of the old classics. There's something so refreshing about the simplicity of the NES-era games. Fewer bells and whistles but such solid core gameplay. Two classics! I haven't been able to play Mother 3 yet, but I've read really good things. Remember the music from the SNES Star Fox? I still get pumped up thinking about the music in the first level. Epic. Super Mario RPG and DKC were also great. I wonder whatever happened to Geno and Funky Kong? Morrowind is an interesting example. Having all your old characters opens up the possibility for "revisiting" a cast of old friends. You would be comforted by the shambling undead masses. I played Secret of Mana with brother as well. We always wanted to get a multi-tap-thing for three-player co-op, but it never happened. Maybe this is a good excuse to download it for the Virtual Console? I played Legend of Mana for the PS1, and while it was visually appealing, the gameplay wasn't that great. Mmm... Secret of Mana. That's one of the few games I purchased full price for the SNES, and I was happy to have done so. I really should dig it up and play it with my wife. That said, the AI is very useful for one thing: magic stacking. Players have to wait for their character to go through their "cooldown" animation before they bring up the command ring to fire off each spell. That gives enemies enough time to move around a bit and maybe attack. If you play as the boy, though, you control the girl's and the sprite's command rings remotely, and can pull them up at any time. You can pull up their command ring before they go through the cooldown animation and fire off another spell. This way, you can keep a baddie locked in place as they keep getting hammered by a series of spells. It's cheap, but it allows you to absolutely destroy dangerous foes fairly safely, as long as you can target them and have the MP (and timing) to keep up the chain. The funny(or sad?) thing is, that the infamous stack of unplayed/unfinished AAA-games that we all seem to have kind of killed that manner of returning to older beloved games, at least for me. I remember the times when I only owned a PS2, I probably finished Metal Gear Solid 2 once between every new game I played. I think I went through Final Fantasy X almost three times and thats a 50-80 hour game. Yeah, and then multiplatform gaming crashed in and since 2007 developers seem to have decided to constantly increase the must-have games per year. Banjo-Kazooie and the Secret of Monkey Island never fail to remind me that humour still exists in video games. Does your wife like video games? I was trying to decide whether someone without a lot of game experience, or who is coming to the game new would enjoy the game. I know what you mean about the constant stream of new titles. Like you, I often start an old game, get a taste, and then put it down. I must have played the first room of Metal Gear Solid 1 a million times! Intentionally humorous games are few and far between. I loved the Banjo games. I used to have a Banjo-Kazooie t-shirt, but I wore it so often it became faded and stained beyond recognition. Our dad bought FF Tactics for my brother and I as some sort of birthday or Christmas present or something. At the time, it was very hard to find a copy of it, as it was several years after its release. Eventually he found it on e-bay for substantially more than its original MSRP. We were ecstatic! However, only weeks later, it was re-released as one of the PS1's "Greatest Hits" games. I'm not sure if my wife will like it. She played some platformers growing up, but RPGs of any stripe are alien to her. Once we move into our new place, I'll try her on it and see what happens. I tend to think she'll like it well enough, but won't stick through the whole game. Thankfully, it's easy to pick it up in fits and spurts as a second player.